Last night I wrote a post about a story my friend told me about some musicians being arrested for playing at a wedding “without permission.” However, since the case is still ongoing, I have decided to take down the post until things are a bit more settled. Meanwhile a six-man band known as Police Band who perform at weddings in the state was equally smashed by agents of the board on allegation that they were performing without a permit of the board. The band is led by one Solomon alias Solo, an emerging entertainer. 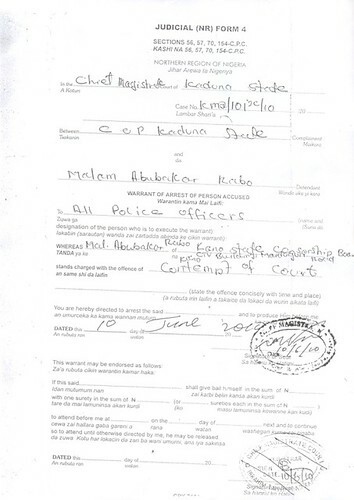 When I first heard about this story, my friend told me that the Police Band was registered with the Kano State History and Culture Bureau…. Readers may remember that two weeks ago, the Kano State Censorship Board also shut down a 23,000 euro international concert organized by the French embassy and the Kano State History and Culture Bureau, being hosted at the Alliance Francaise, for not “seeking permission” to hold the event. I was told the following information by several people I will not name. I cannot, at this moment, verify the details of this report, only that it is oral testimony (over the phone) from several people who were involved in the event. I hope to talk to someone in the administration of the Alliance Francaise tomorrow to get more concrete details. 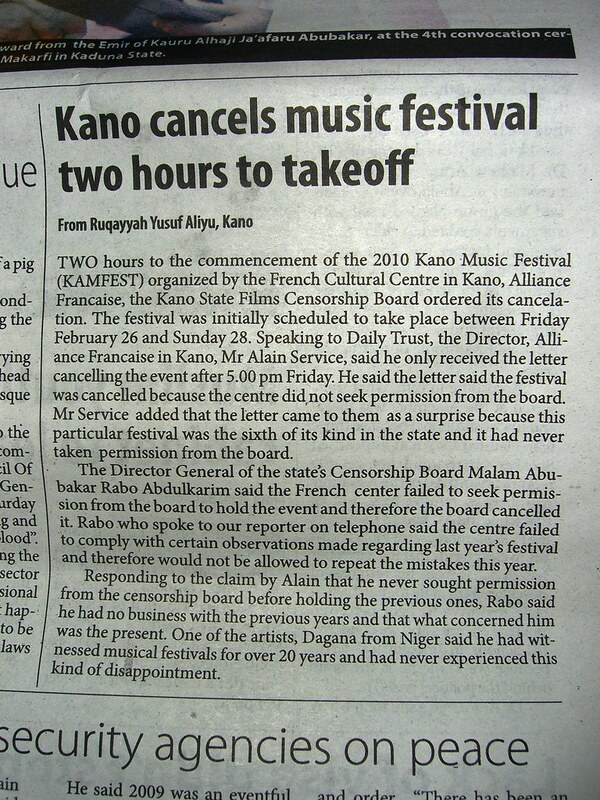 Apparently, yesterday, 26 February 2010, the three day Kano Music Festival, being hosted at the Alliance Francaise in Kano was shut down on the first day of the event by representatives of the Kano State Censorship Board and not allowed to continue with the rest of it’s scheduled events. According to one person I talked to, the festival was closed down because Hausa musician Maryam Fantimoti was to perform and she was not registered with the Kano State Censorship Board. There will be performances from several musical groups from across the globe including the famous Soubyana Music from Chad, the Dangana group from Niger, the Nassiru Garba group from Nigeria and the Trio Belhumeur from Upper Brittain. Another source told me that over 20,000 euros had been spent on the cultural event, which did not end up holding, as it was closed by representatives of the Kano state government. 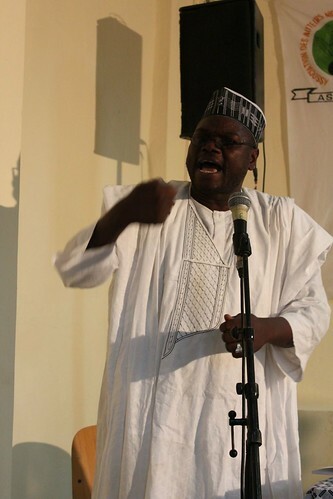 The Alliance Francaise has hosted the Kano Music Festival (Kamfest) for six years in a row. The event had the support of the Kano State History and Culture Bureau. Readers may recall that this is coming on the heels of a recent closure of 15 shops by the Kano State Censorship Board for selling films on the history of Islam. 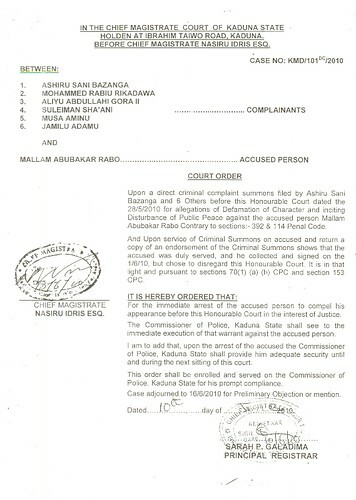 The Kano State Censorship Board has also been responsible for multiple arrests and business closures of those working in entertainment related fields. In a related closure of a cultural event, the hisbah closed down a fashion show organized in honour of designer Zainab Hamza in May 2009.